Pumpkins seem to possess a mythical, magical quality to them like no other fruit or vegetable. Who doesn’t have childhood memories of the Fairy God Mother turning Cinderella’s pumpkin patch into a beautiful carriage – not to mention to spooky delights of a Jack-O-Lantern glowing ominously on the front porch during Halloween. Whether you consider yourself a pumpkin fan or not it is undeniable there is something uniquely alluring about this particular plant. If you are planning on eating, cooking, growing or if you simply just want to know more about pumpkins, make sure you take a look at this must-read article that will shed new light on this age old dinnertime favourite. First things first – what is pumpkin? Despite often being referred to as a vegetable, pumpkin is actually a fruit – strange I know – and technically has more in common with berries than say a carrot. 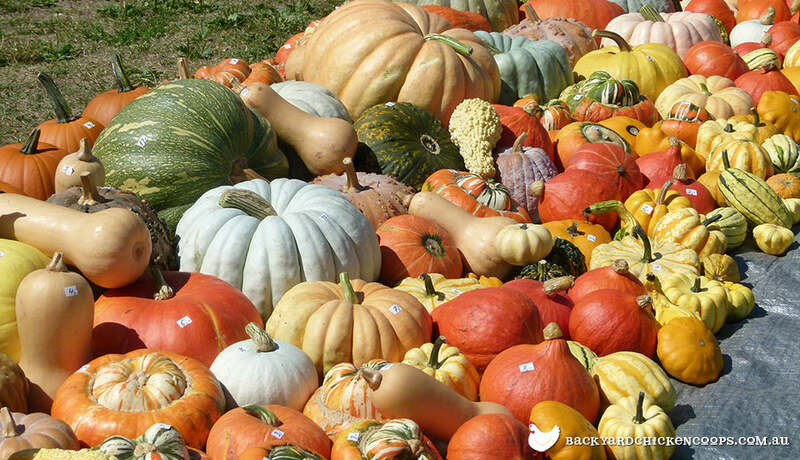 Pumpkins belong to a category of plants known as the Curcurbita family, which includes zucchini, squash and cucumber. Technicalities aside, pumpkin fruit is an incredibly healthy addition to anyone’s diet, rich in all kinds of antioxidants, vitamins and minerals. Most importantly, pumpkin is a hearty, delicious and versatile ingredient that can be used to make anything from soups, to desert, to Italian cuisine – whatever pumpkin touches seems to turn to gold (or should I say orange). Are there different types of pumpkins? Butternut Pumpkin: sometimes referred to as Butternut Squash, this variety tends to have an oblong bell like shape, with yellowish skin and an orange flesh. It tends to have a slightly sweeter and nuttier flavour compared to other pumpkins and has an average size of around 2 kg. Jap Pumpkin: also known as Kent Pumpkin, has green skin mottled with yellow and brown patches, with orange flesh. This nutty variety has an average weight of 4 kg, with a longer maturation process. These are the most common types of pumpkins grown in Australia however there are so many amazing varieties out there to investigate, like Atlantic Giant Pumpkins and Golden-nugget pumpkins, just to name a few. What makes pumpkin so good for you? As mentioned previously pumpkin is a rich source of many vital antioxidants, vitamins and minerals, like kale and cauliflower. Specifically, pumpkin is one of the densest sources of vitamin A that helps your body maintain healthy skin and mucus membranes, while also being great for your eyesight, as well as possibly helping prevent lung and cavity cancers. Pumpkin is also incredibly low in carbohydrates, with no saturated fats or cholesterol, which makes it a favourite of many dieticians when helping people lose weight and lower their cholesterol. Other vitamins and minerals include vitamins C and E, as well as lutein, xanthin and carotenes. What parts of the pumpkin can I eat? Most people normally only eat the orange fleshy interior of the pumpkin however the leaves and seeds are also perfectly edible as well. It is uncommon to eat raw pumpkin flesh as most people prefer to roast, cook or boil their pumpkin, as a means to soften it and improve the taste. Pumpkin seeds in particular are a delicious source of protein, omega-3 and fatty acids, making it perfect for a snack or garnish. Leftover scraps of pumpkin and pumpkin seeds are the perfect treat for your chickens – so please don’t forget to treat them to the excess scraps you don’t need or want before you throw it all in the compost. Note of warning though: chickens normally won’t eat pumpkin skin itself, but they will happily peck at the remaining flesh – so be sure to relocate the pumpkin skin into the compost once the chickens have stripped it clean. What is a simple and easy way to cook pumpkin? Chop approximately 1 kg of pumpkin into chunks, removing the seeds and giving them to your chicken or compost – remember the smaller the chunks the faster it will cook. Also, it’s up to you whether you decide to leave the skin on or off. Dump all the pumpkin chunks into a large bowl or container. Drizzle 2 tbsp. of good quality olive oil, along with 1 tsp. of cinnamon and 1 tsp. of salt onto the pumpkin chunks, before mixing it through vigorously using your hands. Spread a single layer of pumpkins chunks onto 1-2 baking trays. Roast in the oven for 40-45 minutes (or longer depending on the size of the pumpkin chunks) until soft and caramelised. Roasting pumpkin is pretty simply stuff, but remember you can always spice things up by using a variety of different spices that pair well with pumpkin, such as, ginger, coriander, sage, nutmeg, vanilla and cloves. How else can I use pumpkin as an ingredient? There are simply so many different culinary innovations people have made using pumpkin as a key ingredient. 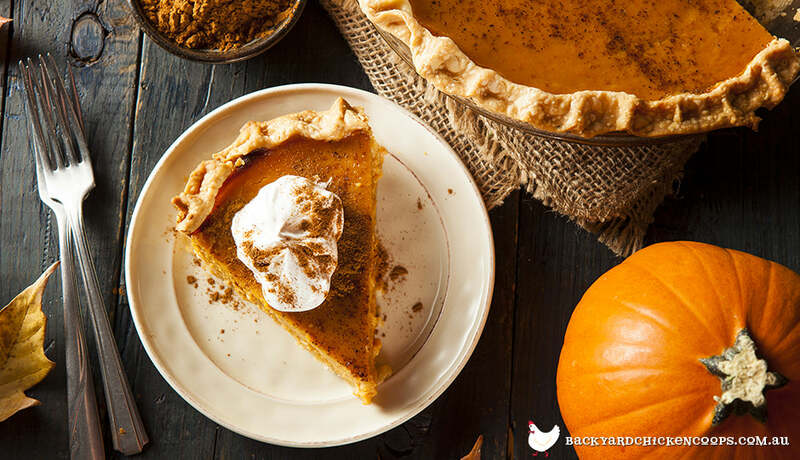 The sweetness and smooth texture of pumpkin has led many culinary gurus to use it in desserts – who hasn’t heard of pumpkin pie? Another delicious pumpkin treat for anyone who has a sweet tooth is pumpkin pancakes – who would have thought of that? Not to mention pumpkin cupcakes or mini pumpkin cheesecakes! But, can anything really compare to a beautiful, warm bowl of pumpkin soup with crusty French bread at the end of a hard day…? I’ll let you make up your own mind. How do I pick the best quality pumpkin? Whether you’re at a farmer’s market or a supermarket the rules are still the same when it comes to selecting a delicious and nutritious pumpkin. First, inspect the pumpkin to see if it has any cuts, bruises or peculiar discolorations on its skin. If the pumpkin doesn’t look 100% on the outside, chances are it won’t be of the best quality once you take it home and cut it open. Simply place that pumpkin to one side and keep looking. If you find a pumpkin that visually seems to meet the grade, hold it up to your ear and give it a firm knock. A healthy pumpkin will produce a solid woody sound, not unlike when you knock on a wooden door or table. Where should I store my pumpkins? Simply keep your pumpkins in a cool, dry and well-ventilated spot in your kitchen. Too much heat will cause your pumpkin to age and rot relatively quickly. Some people segment their pumpkin, wrap it in cling wrap and store it in the fridge. This will of course cause the pumpkin to decline in flavour and quality more rapidly, but it is a good option is you are short on space and the temperatures outside are starting to rise. How can I grow my own pumpkins? All things considered pumpkins of all varieties are relatively easy to grow. The most unique aspect about growing pumpkins you’ll need to consider is that fact that the vines grow directly upon the ground surface, before eventually sprouting large pumpkin fruits. Here are some fast facts about growing pumpkins that will help you with your backyard adventures. Pumpkin vines grow best in fertile, compost-rich, well-drained soil that has access to full sunlight, with a PH level of approximately 6-6.5. Soil needs to be ideally around 20 degrees, but not less than 16 degrees, if the seed is to germinate and start growing. It is a smart idea to mix chicken manure into your soil patch 4-6 times before you sow the seeds. This helps ensure that the soil is rich in all the essential nutrients it will need to help produce a nice, big, healthy pumpkin. Pumpkin vines do not develop deep root structure, which means it’s imperative that they are watered regularly during dry, hot and windy conditions. Pumpkins grow exceptionally well in weather around 20-35 degrees, making it the perfect plant to grow in tropical climates all year round. It is vital that you implement a smart approach to crop rotation when growing pumpkin, as it can quickly sap your soil of essential nutrients. Ideally you should grow leafy greens, before planting pumpkins and eventually move on to root and legume vegetables. Though growing pumpkins is reasonably easy, it’s important that you keep the basics in check, just to ensure the success and quality of this delicious crop. 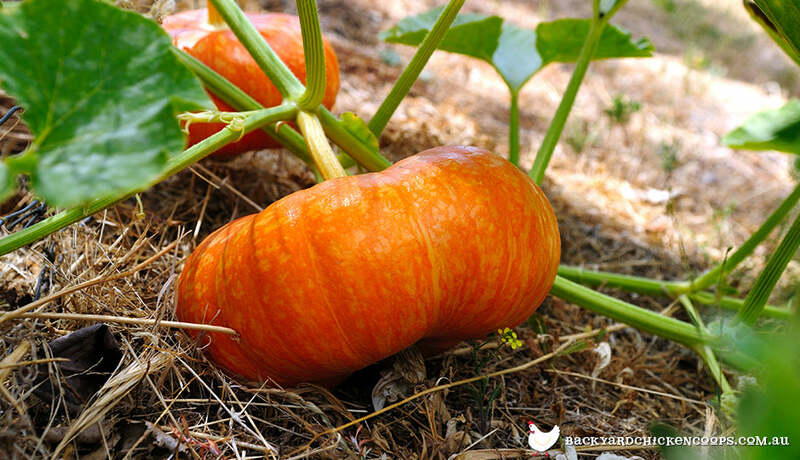 Many garden and vegetable loving Australians will be able to relish the joy of eating, cooking and growing pumpkin all year round. Chickens are possibly one of the best companion animals to eating, cooking and growing pumpkins because they’ll not only gladly help you get rid of your scraps, but also nourish the soil with their droppings, to ensure bountiful pumpkin growth in the future. If you decide to invest in a flock of chooks to help you make the most of the pumpkins that come through your garden and kitchen, be sure they have a nice home to live in, like the Taj Mahal, Penthouse and Mansion coops.